Every year Massimo takes a small group of food and wine lovers to his home region of Puglia, world-famous for its scenery, its wine and olive oil, its fresh fruits, vegetables, amazing seafood and more. Puglia is an ancient place full of culture and beautiful architecture, sandy beaches and limestone cliffs - an experience you'll never forget! And best of all, a special dinner at Massimo's mother's house! DAY 1: Arrival - It’s arrival day! We will meet the group at our recommended hotel in Bari – or the local airport – and transfer to Masseria Aprile (alternate pick up can be arranged in advance). Tonight let’s discover Locorotondo’s old town, get to know each other, and at 8 pm we’ll go for dinner at a local pizzeria in town. Dinner with drinks included. DAY 2: Alberobello - Today we visit the UNESCO world heritage site of Alberobello, famous for its more than 1,500 trulli located right in the city centre. We'll have a wine tasting at Albea winery followed by a late seafood lunch in Polignano a Mare, then take a walk through the old town where we’ll find some amazing gelato - it's a must! This evening we’ll stop for a light dinner or a snack in the picturesque hilltop town of Locorotondo before heading back to the Masseria. Wine tasting, excursion and lunch with wine included. DAY 3: Lecce & Cooking Class - This morning is free to spend as you wish – sleep in, wander into town (Locorotondo is a short distance) or just find a quiet spot to read a book. We will have a picnic lunch at the masseria before heading to the southern part of Puglia to visit the picturesque Baroque capitol of Lecce. We’ll take a walking tour of the city before attending a cooking class and dinner with the wonderful Chef Gianna Greco. After a long day, we’ll make our way back to the masseria, where we have the rest of the evening to relax and do as we wish. Lunch, cooking class, dinner and selected wine and excursion included. DAY 4: Ostuni - Today we’ll visit one of the oldest olive groves in Puglia, and enjoy an olive oil tasting at Masseria Brancati in Ostuni. We will eat lunch at a local restaurant in Ostuni before spending the rest of the day relaxing at the Masseria. This evening we’re off for a visit to a local Caseificio to see how they make burrata – before heading to a typical Puglia grill house (braceria) for dinner. DAY 5: Polignano a Mare - Today we’re off to the coast! 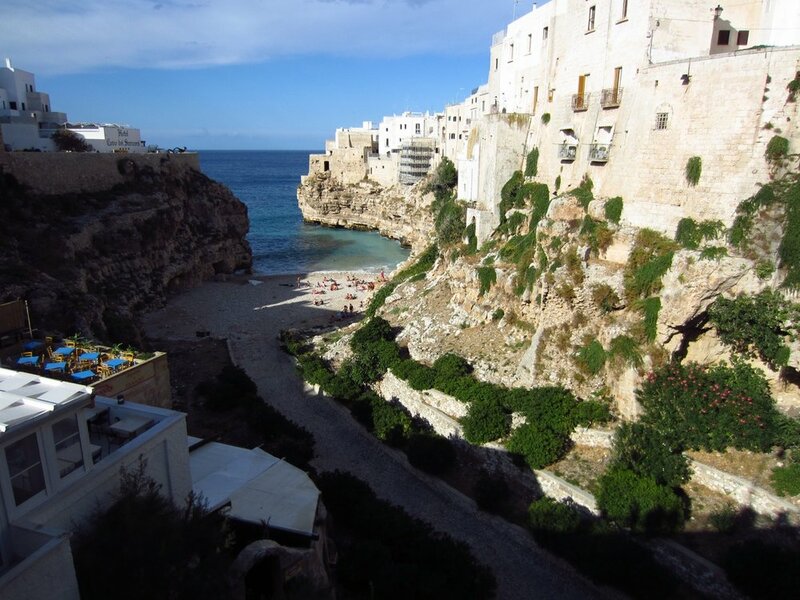 We’ll visit the beautiful town of Polignano a Mare for a boat tour of the coast (weather permitting). We’ll stop for lunch at local seafood restaurant before heading back to the Masseria (please note: lunch is not included) for the afternoon. We will head into Locorotondo for dinner. DAY 6: Matera- Today we visit the UNESCO world heritage site of Matera, famous for the old houses dug into the rock – the “sassi di Matera”. Our local guide will explain this fascinating site and answer questions. We’ll stop for lunch at local Salumeria. After lunch, we make our way back to Masseria together, where we will have a special dinner: a Panzerottata, (a typical Puglia calzone) and, of course, more food. DAY 7: Lunch with the Bruno Family in Toritto! - Today is the best day of all - lunch with "mia famiglia"! My mom, Francesca, and aunt Anna will make a nice southern Italian style lunch with homemade orecchiette pasta. After this, we visit my hometown of Bitritto – it’s not a tourist destination but my heart is still there and I have many stories to tell! After seeing Bitritto, we head back to the masseria. You probably won’t be hungry for the rest of the day! This evening is free to spend as you wish. If you’re adventurous, you can walk to Locorotondo on your own, 1 km from Masseria or just relax at Masseria on your own. Lunch and activities are included. DAY 8: Departure - This morning it’s time to bid farewell to the group. Now you’ve had a chance to see Puglia through the eyes of an Italian chef, enjoy a home-cooked meal with my mother, and witness some of the cultural and culinary treasures this region has to offer. You’ve sampled some of the best meats, breads, cheeses, oils and wines in the world – and you may have even have picked up some Italian phrases! But the best part of all is that you can go back home and relive some of these incredible memories through your own cooking There will be one group transfer service to Bari (details will be provided). If this doesn’t suit your plans, we will help you make arrangements to get to the airport or on to your next destination, just ask. Custom tours can be arranged, please ask. Please note: this is a loose itinerary al'Italia! The included activities will remain the same, but the timing may not be exactly as described.